President Obama has made reducing income inequality a common theme in his second-term speeches and policy proposals, and has cited inequality as “the defining challenge of our time.” His administration’s recently proposed carbon regulations, however, will increase prices for consumers and lay off thousands of workers, disproportionately hurting low-income and middle-class Americans. This month, the EPA released its plan to reduce carbon emissions in the U.S. by 30% in 2030 relative to 2005 levels. The EPA is requiring states to devise plans to reduce their carbon emissions by state-specific targets over the next couple of decades. Each state will be able to decide how to accomplish its goals, whether through instituting a cap-and-trade plan, a carbon tax, or an alternate proposal. The regulations will saddle fossil fuel producers with the cost of upgrading their power plants to meet the emissions reduction targets. Energy producers will be forced to respond to these costs by shuttering power plants and reducing energy output. In its analysis, the EPA expects that the new regulations will force coal producers to reduce their power generation by 19% by 2020. The EPA also expects total power generation to decrease by 4.6% by 2020. According to the EPA, natural gas production will increase in the short term as it replaces coal, but production will decrease in the long term. In addition to reducing output, fossil fuel producers will be forced to pass on the costs of regulatory compliance to consumers in the form of higher prices. In fact, the EPA admits that their regulations will raise the price of electricity. According to the EPA’s analysis, electricity prices in the contiguous U.S. will rise by up to 6.5% by 2020 and by up to an additional 3.1% by 2030 above the EPA’s baseline. These price increases serve as a regressive tax, similar to a sales tax. 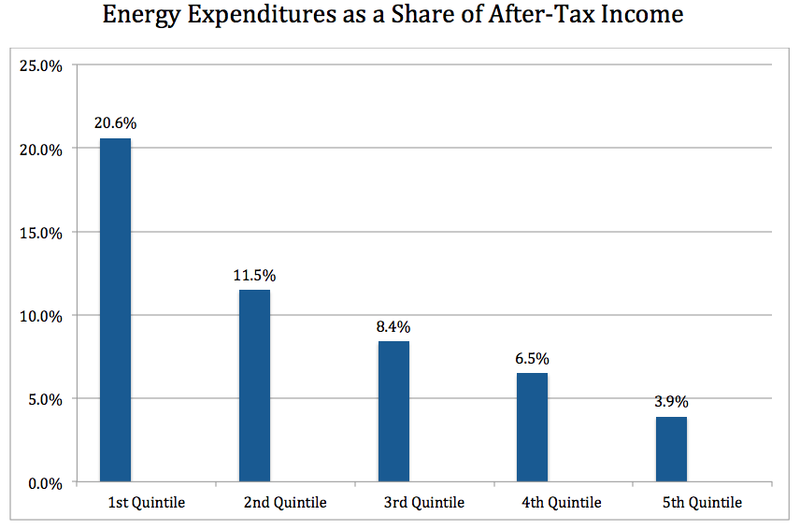 As a family’s income decreases, it spends a higher percentage of its income on energy. According to data from the Bureau of Labor Statistics, the average household with an income in the top 20% of households spends 4% of its after-tax income paying energy bills. Households in the bottom 20% spend more than five times that share, or 21% of their after-tax income. All businesses will have to pay more to operate because of rising energy prices as well. Thus, the regulations will force businesses to raise the prices of other goods. Low- and middle-income households spend a higher percentage of their income on essential goods, like food, relative to higher-income households. This effect makes the regulations’ burden on lower-income families much greater. The EPA, however, claims that household electricity bills will actually decrease in the long run. The agency hopes that households will use less electricity by investing in motion-detecting light switches, energy efficient appliances, and other technologies. While U.S. energy demand has been decreasing recently, the EPA assumes that households will decrease their demand far enough below the baseline to decrease their electricity bills. In fact, the demand for electricity is relatively price-inelastic, meaning that households will not be sensitive to a change in electricity prices. Because energy costs are necessary, families would likely reduce their consumption of other goods. The EPA also assumes that families can afford to adopt new energy-efficient technologies, when many cannot. Low-income families will have to sacrifice much more than other households to adopt new technologies to avoid higher energy bills. Furthermore, the new regulations will force energy producers to lay off blue-collar workers to meet compliance costs. Because higher energy costs will impact all businesses, non-energy firms will feel the need to downsize as well. The U.S. Chamber of Commerce reported that carbon-cutting regulations could cause firms to lay off 224,000 workers per year between 2014 and 2030. Of course, many of the lost jobs will be in the energy sector, dooming working-class and middle-class families. Admittedly, this study assumes that energy companies will cut more emissions than the guidelines require, but it sheds light on the regulations’ impact on workers. In fact, EPA regulations have already taken their toll on working-class jobs. According to a report from SNL Energy, coal mining jobs declined by 9.3% in 2013 and 17.7% since 2011. According to the report, this decline was mainly driven by EPA regulations that target certain pollutants, like sulfur and mercury, and present higher costs to coal producers. Energy analysts expect a similar effect to occur with the EPA’s new regulations. While President Obama has made a verbal commitment to improving the lives of working-class and middle-class Americans, his actions on energy policy say otherwise. In order to prevent price increases and job losses, Congress should act swiftly to oppose the EPA’s plan. Tags: EPA. Bookmark the permalink. I enjoyed reading this politically incorrect — but factual (assuming a priori estimates are factual) — take on this new proposed regulation. Nice work.